President Nana Akufo-Addo has retained his position as the Most Influential Public Figure in the 2017 Ghana Social Media Rankings spearheaded by Avance Media, CliQAfrica, Eazzy Social and Dream Ambassadors Foundation GH. 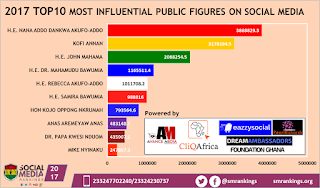 The ranking which focuses on politicians, business figures and diplomats had President Akufo-Addo maintaining his leading position across Facebook, Instagram and Twitter with an unprecedented 2.5 Million followers in 2017. In 2017, President Akufo-Addo also recorded the highest number of new followers numbering 1,029,059 which keenly followed by ex-President John Mahama’s 585,285 new followers. New personalities who made the annual ranking for 2017 include: H.E. Rebecca Akufo-Addo, Hon Kojo Oppong Nkrumah, Anas Aremeyaw Anas, and Mike Nyinaku. With appraisal to the 2016 Rankings, E. Kwesi Bekoe Amissah-Arthur, President Jerry John Rawlings, Lucy Quist and Lordina Mahama were the Public Figures who moved out of the ranking from 2016 to make way for new Entrants but still do possess great chances together with Dr. Matthew Opoku Prempeh, and Nana Appiah Mensah to make subsequent rankings.